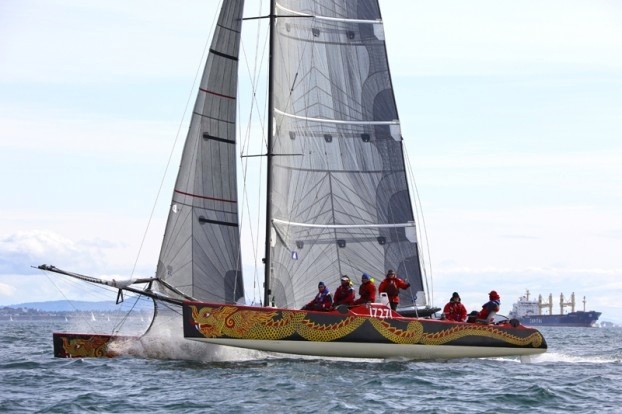 The local Seattle formula 40 catamaran Dragonfly capsized during the Cow Bay Regatta. Not my design. It was originally from New Zealand and was originally named Simply the Best. It’s owner Pat is one of the best sailors I know. I hope to find out more soon, but I was told that it rolled over on a reach after stuffing into a kelp bed. It was a heavy air day. If it could happen to Pat, it could happen to anyone. I see the boat is on the hard in Everett, sans mast. Pic is on happier days.